UNITED NATIONS, January 15 -- After Nepal sent Major Niranjan Basnet, charged with the torture and murder of a 15 year old girl, to the UN Peacekeeping mission in Chad, human rights groups protested. The UN send Basnet back to Nepal, but the Army has refused to turn him over to civilian authorities for trial. Inner City Press asked the UN about this on December 24, but UN spokesman Martin Nesirky said that "a national Government is responsible for national armed forces." 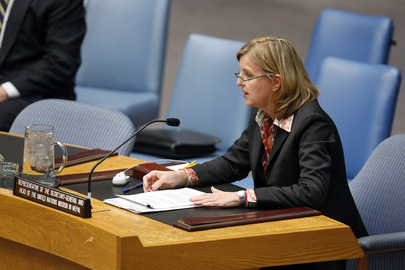 On January 15, after UN envoy to Nepal Karin Landgren had briefed the UN Security Council, she emerged to a stakeout without any journalists. They and the UN had become, since the January 12 earthquake, all Haiti, all the time. Inner City Press ran after Ms. Landgren and asked if the UN Mission in Nepal has raised to Nepal's government or army the need to hand Basnet over to civilian authorities for trial. No, Ms. Landgren said. That is a "matter primary for DPKO and the Office of the High Commissioner for Human Rights." Inner City Press asked if it didn't have political ramification of the sort that UNMIN is charged to deal with. "It's a peacekeeping and human rights issue," Ms. Landgren answered. Later she acknowledged that there is a "link with impunity." When asked, she said that UNMIN raises impunity "in a general way" with the parties. But not about Basnet. Why not? Watch this site. Footnote: following Ms. Landgren's generous hallway answers, Inner City Press would have asked for further UN clarification at Friday's noon briefing, but UN spokesman Martin Nesirky said that "I'm sticking on Haiti today," and has declined to response to many e-mailed questions. And so the UN Secretariat, DPA's and UNMIN's position appears to be that the the refusal by a government of a major TCC to put on trial an accused torturer and murder is... merely an internal matter. Basnet and other war criminals must be happy with the UN's post Haiti earthquake desire and communications need to stay "on message," regardless of what happens elsewhere. Watch this site. 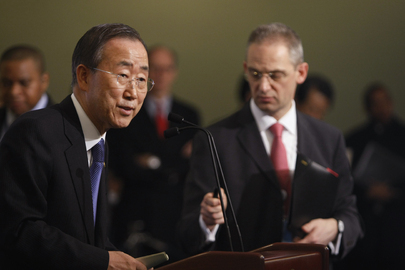 UNITED NATIONS, January 15 -- UN Secretary General Ban Ki-moon will fly to Haiti for a one-day trip on Sunday. To publicize his trip, Ban will be accompanied by journalists from France's wire service and television station, and in a surprise to some, South Korean media. Several journalists who had put their names on the list to go demanded to know why they were not included, while not only South Korea media but also the UN's own in house self documentarians were selected. One reporter, representing a major South Florida daily, says he was told by Ban's spokesman Martin Nesirky, this is not like selecting a soccer team, I don't have to say how I made choices, remember, I'm not new at this job, I was with Reuters for years. When pressed, Nesirky told the reporter the criteria included multi-media platforms, "coverage of the UN," circulation, history of covering the region and inclusion in the directory of the UN Correspondents' Association. At least one of the invitees does not comply with this last criterion. And it is unclear, at least to some, if by "coverage of the UN" positive or negative coverage is meant. While the inclusion of South Korean media seems designed, several correspondents told Inner City Press, to feed Ban Ki-moon's image in his native country, they also saw a wider communications strategy at work. The earthquake was and is a disaster, they were quick to acknowledge. (We agree.) But for both Ban and his spokesman to resist for days now answering questions on any topic but Haiti represented, to them, a drive to remain "on message" as a politician would. At the January 15 noon briefing, Nesirky told Inner City Press that "I'm sticking with Haiti today," when a question about a rocket attack near the UN in Kabul was being raised. Video here, from Minute 43:05; the exchange was omitted from the UN's transcript. While Nesirky later relented and allowed this and a question about the UN in Somalia to be asked, ten hours later neither question had been answered. Notably, a 2000 word expose of corruption in Ban's UN that moved on American newswires on Tuesday was never asked about or responded to, lost in the UN's wall to wall statements on Haiti. Even on Haiti matters, controversies were identified, outsourced and marginalized. When questions arose about Ban not counting casualties above the UN's national Haitian staff in the nation-specific presentations he made, to member states and to the press, Ban next said he would not report by nation, only Nesirky would. Nesirky in turn tried to explain the UN's reporting focus on international staff, and then to argue that while processed differently, reports of the deaths of national Haitian staff were treated equally. Most recently, Ban has been accused by French President Nicolas Sarkozy of saying and accomplishing too little before, at and after the Copenhagen climate change talks. Responses to natural disasters are the UN's finest (media) hour, these long time correspondents said, pointing to the post-tsunami omnipresence of Kofi Annan's humanitarian coordinator Jan Egeland. In this case, Ban himself needs better coverage -- the correspondents tied it to Ban's drive to get a second five year term as Secretary General, since more than three years of his first term have expired -- and so he, rather than Egeland's successor John Holmes, is presented day after day at the stakeout camera. And now on a flash tour of Haiti, documented by the UN itself and South Korean media. Mr. Ban has scheduled a meeting with UN staff in New York for Monday at 11 a.m.. Watch this site. Footnote: when Nesirky was selected, and Inner City Press asked if the fact that he speaks Korean and has family and professional tied to Korea, having covered Seoul for Reuters, were part of the reason why, the question was not answered. Then Nesirky came to a briefing and, while taking no questions, pointed out that he speaks German as well, but not French. France is understood to have insisted that UN lead spokespeople speak French, the UN's other working language. Now French print, TV and wire are all included on the Haiti trip, along with South Korean media. Whether all this assists in the drive to assert the UN's centrality in coordinating aid and action in Haiti remains to be seen.